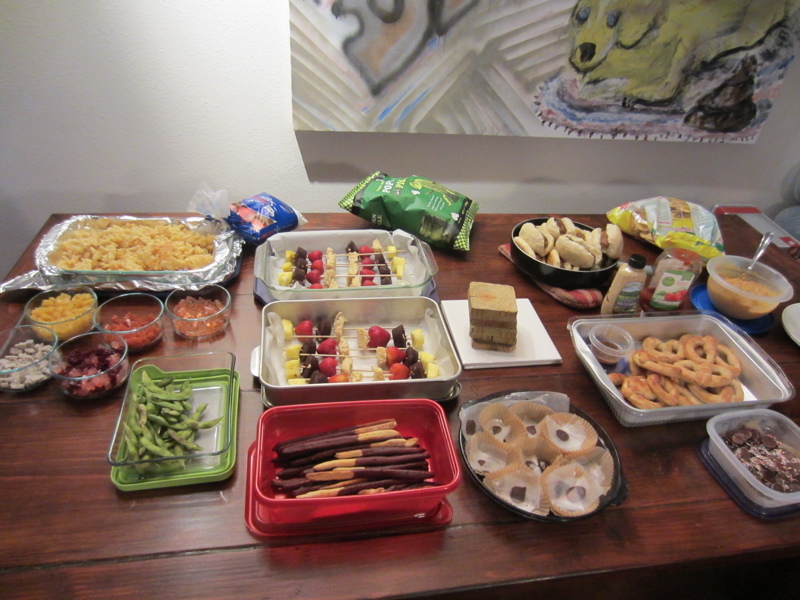 Our fortieth meeting was a “movie snacks” theme. We qualified the foods we decided to make by consuming them while watching a movie–actually two. First we watched the ridiculously good (good in a ridiculous way) Attack of the Killer Tomatoes which Shannon had suggested. We followed it up with the more contemporary comedy called Sisters starring Amy Poehler and Tina Fey because John had already picked it up at a Red Box. 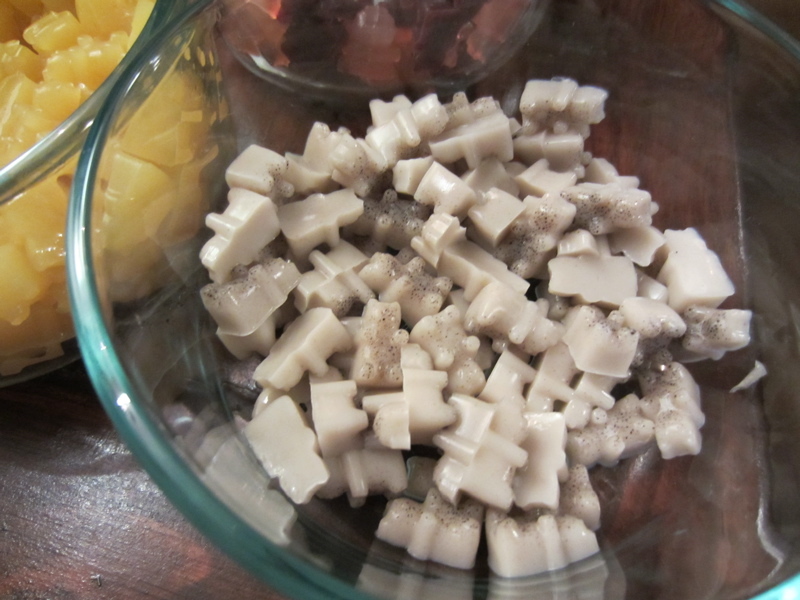 Lilly wanted to make a variety of flavored caramels but ran short on vegan butter, so she opted to put her resources toward lavender caramels. 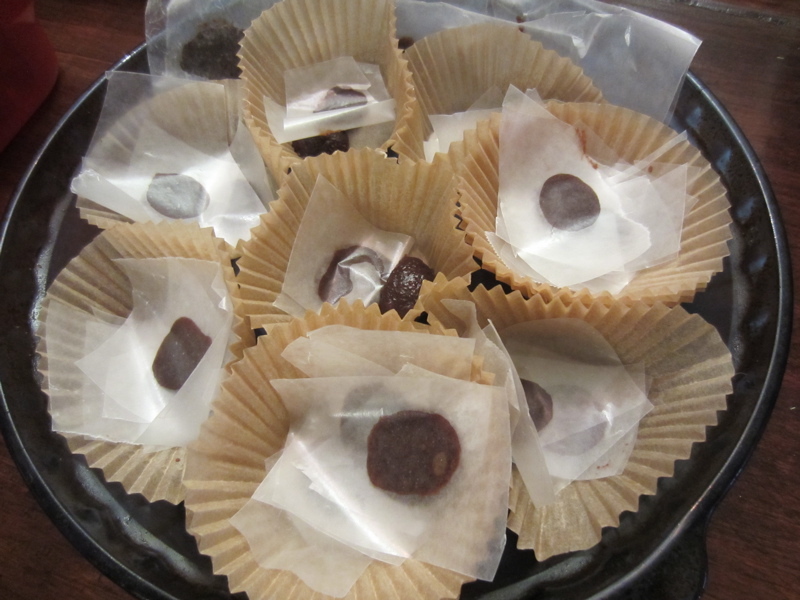 She created the treat with brown sugar, Earth Balance Margarine, Enjoy Life chocolate chips, a couple drops of lavender, and just enough water to combine. Shannon used a recipe for a simple batter consisting of flour, sugar, baking powder, vegan milk, and salt. The instructions indicated that at home you should make this confection in a frying pan. Instead, Shannon poured her batter via funnel into a deep fryer with a basket. Unfortunately, Shannon discovered the reason it was recommend to use a frying pan when her batter got rather stuck to the frying basket. Thus, her funnel cake came to us more as funnel bits, but sweet fried dough sprinkled with powdered sugar is a thrilling treat no matter what the size and shape. After making this, Shannon said she plans to pick something easy to prepare for the next meeting. John acquired a tiny bear mold to makes us these gummy bear like treats. They turned out like tiny bear-shaped jellos in the flavors of: coconut cardamom, grapefruit, nectarine orange, blueberry lemon, cherry, and strawberry orange. To make the bears, he mostly boiled fruit juice with sugar and agar, but for the blueberry lemon flavor he used actual fruit. Caroline brought a selection of treats of varying healthiness levels. 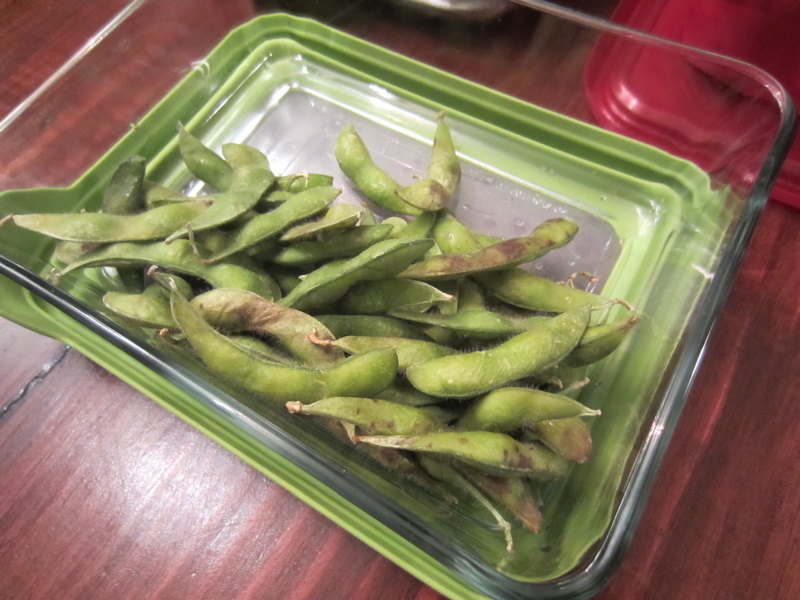 For super healthy level, she cooked edamame, which turns out to be a convenient food to eat during a movie. For a not-so-healthy but very tasty movie treat she concocted Vegan Sno-caps with cocoa powder, coconut oil, powdered sugar, and vanilla. 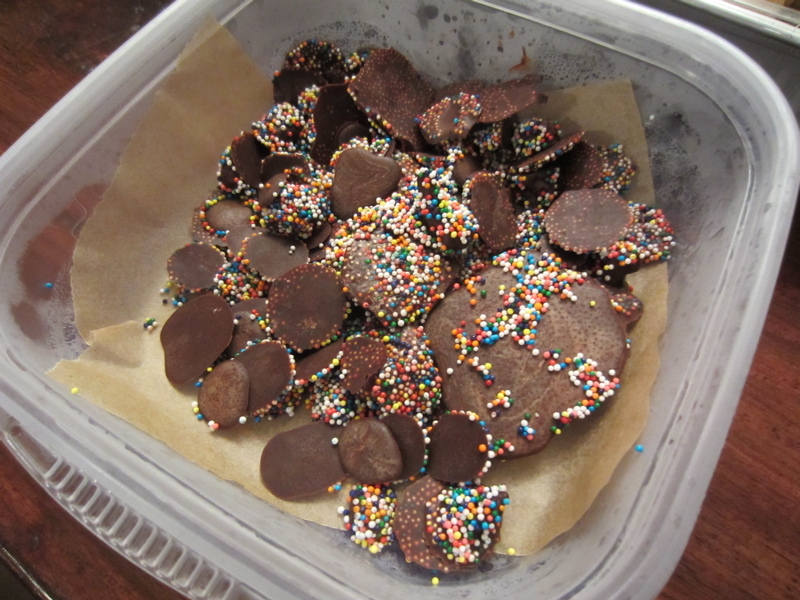 She rolled the chocolates in little colored round sprinkles to get the classic Sno-Cap texture. 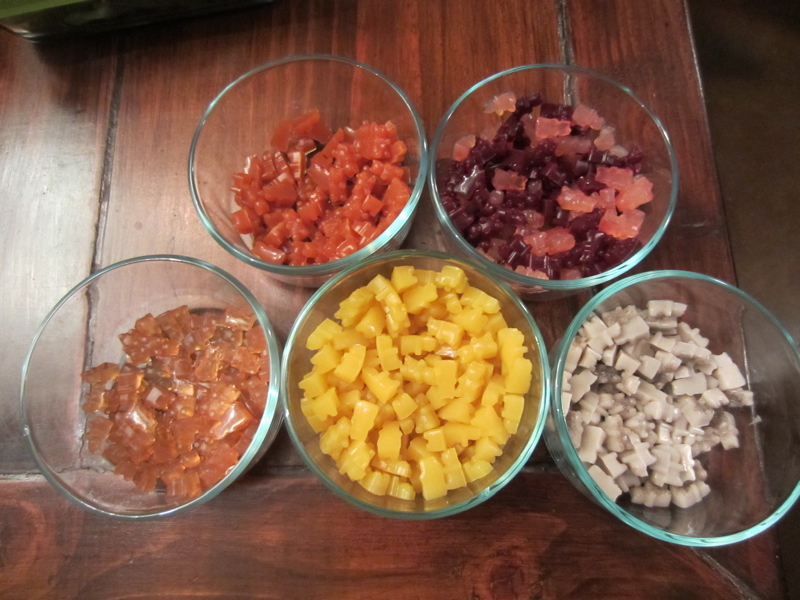 Some of the candies kind of melted to flatness, but they were totally tall on flavor. 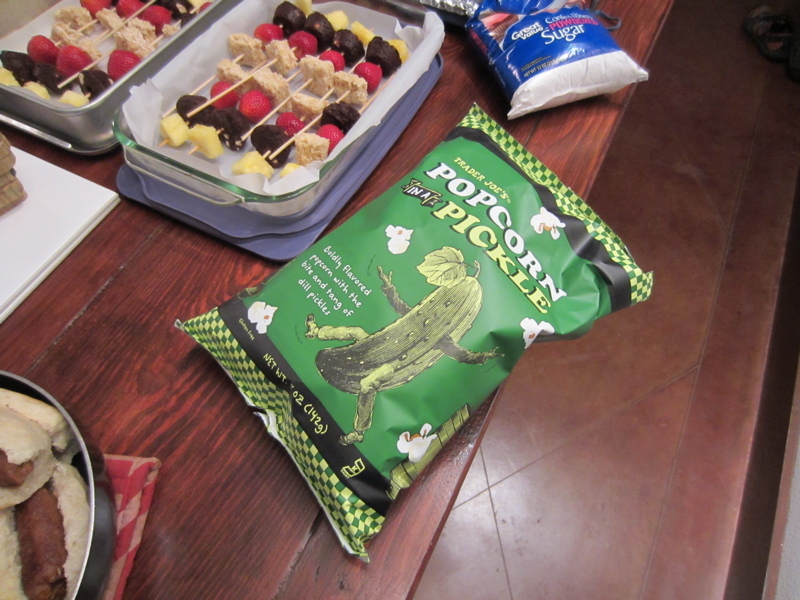 For a mid-range health level, Caroline also brought some Trader Joe’s Popcorn in a Pickle-popcorn that tastes like dill pickles. 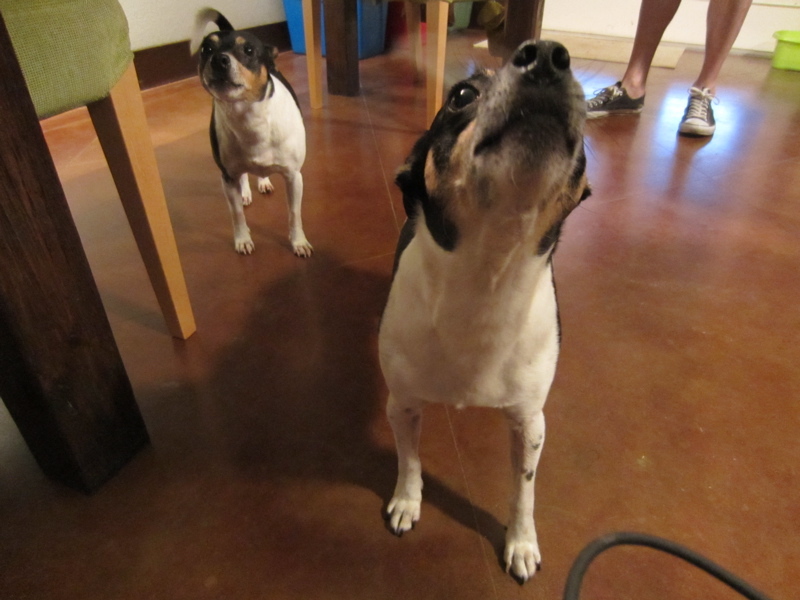 For a final magical treat, she brought Macy! 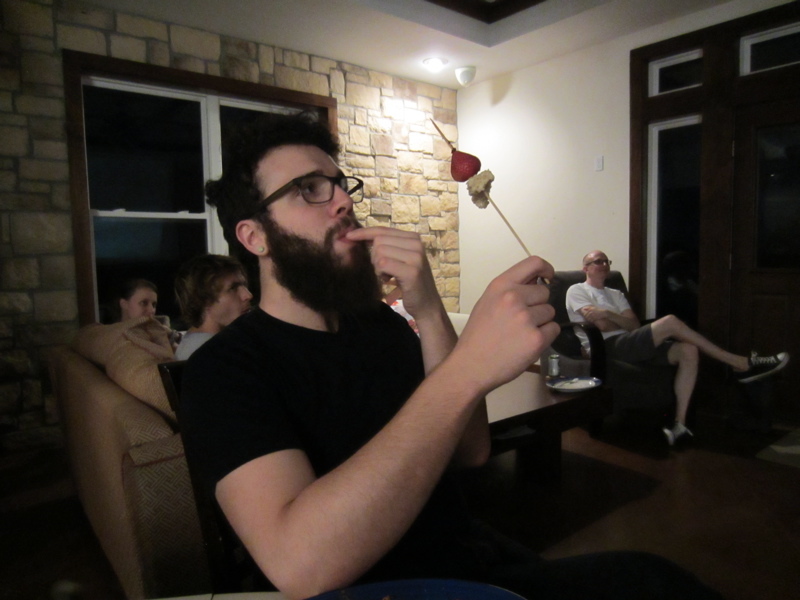 Ramon admitted the kabobs were Slynn’s idea, but he made the non-fruit components, so he deserves much of the credit. 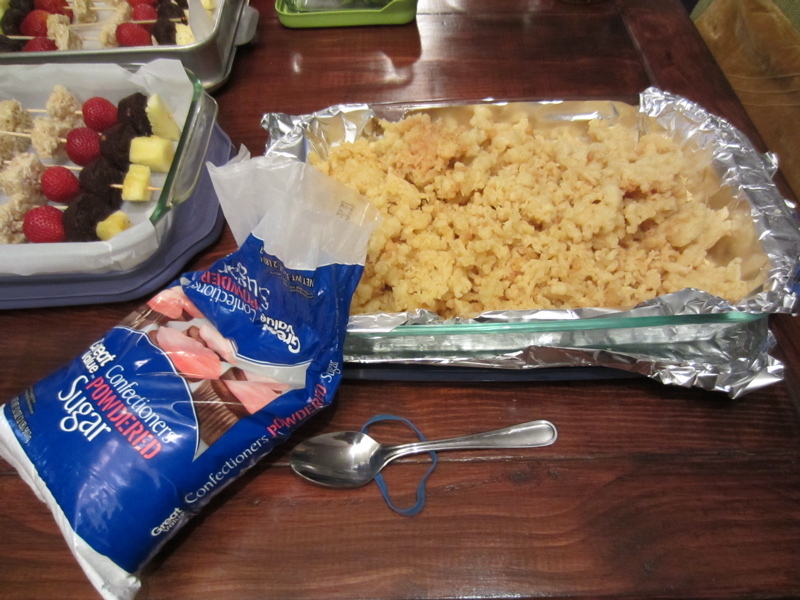 His crispy rice squares made with Dandies turned out with just the right rice crispy treat chewiness. He made the brownie bites with the same Minimalist Baker brownie recipe that Shannon used for the appetizer meeting, baking them in a mini muffin tin so they didn’t even have to be cut for skewering. For a special touch, he added white chocolate chips from Reverie Bakeshop to the batter. 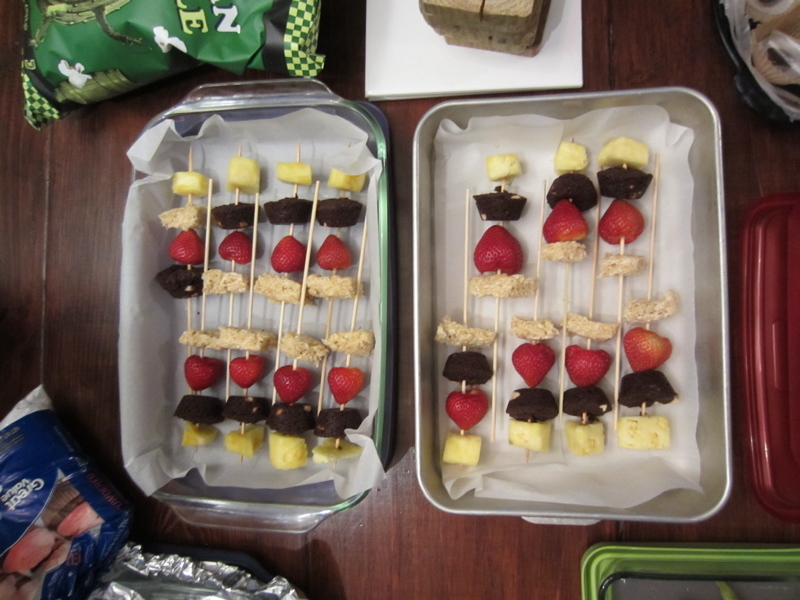 Slynn skewered the brownies and crispy treats with strawberry and pineapple for a more natural sweet kabob component. Billy made vegan queso for nachos. 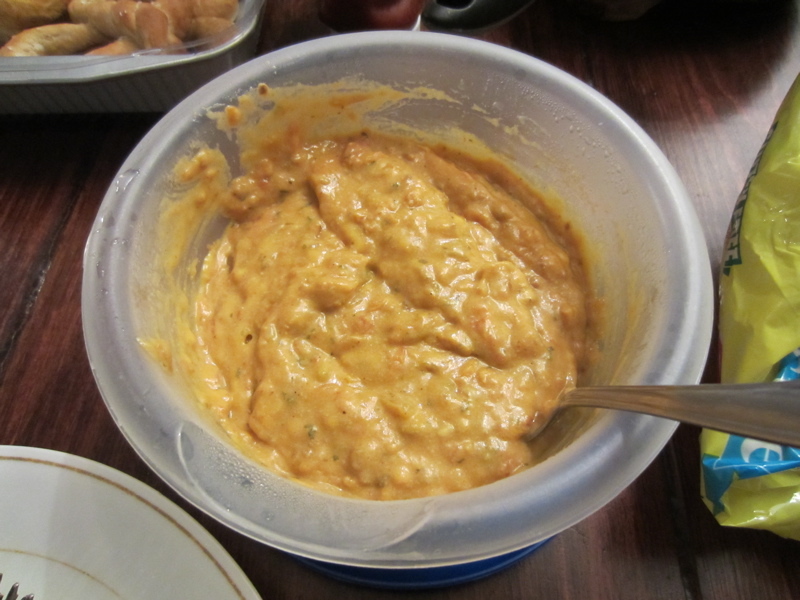 The recipe he used calls for nutritional yeast, flour, salsa, water, margarine, paprika, salt, and garlic. 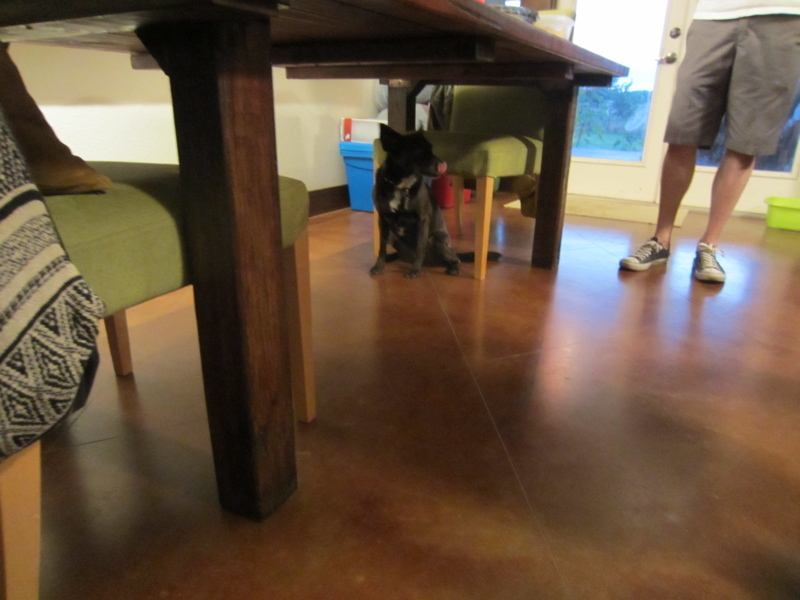 He used garbanzo flour for the flour and almond milk in place of the water. He also added some Daiya Cheddar shreds for extra gooeyness. He served the dip with round tortilla chips like you might get at a movie theater. 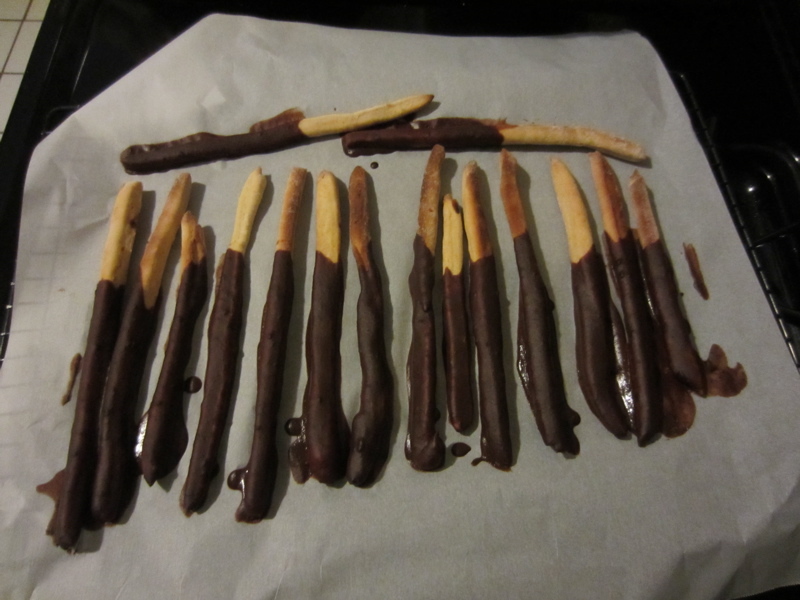 In addition to helping Ramon with dessert kabobs, Slynn made vegan Pocky from a yeast dough and surprising ingredients like tahini and orange zest. She carefully measured and cut the dough to create evenly sized Pocky sticks then dipped them in chocolate chips that had been melted with almond milk. She was disappointed that the chocolate dipping made the initially crispy narrow breadsticks a bit soft, but it didn’t affect the taste. 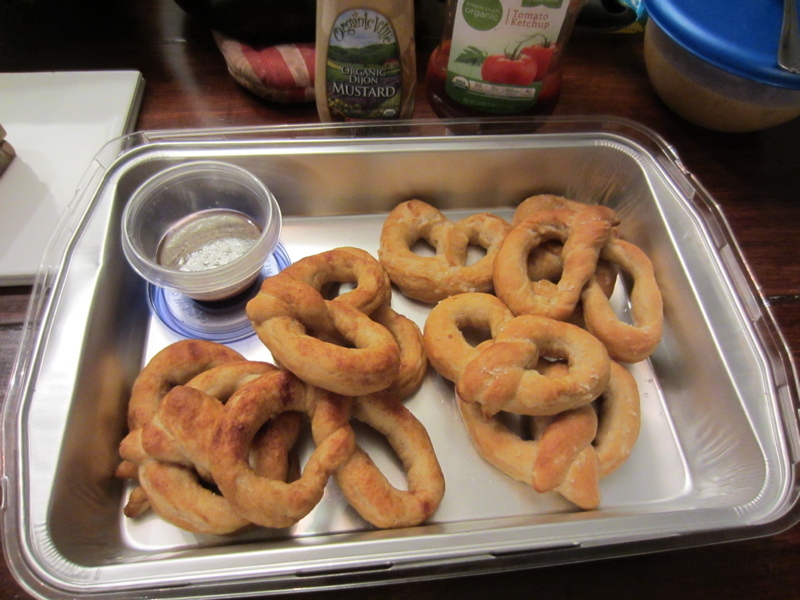 Michelle made small versions of the classic big soft pretzel. As in the pretzel tradition, she boiled the dough in a baking soda bath before placing them in the oven. She seasoned some of her pretzels with coarse salt and others with cinnamon sugar to produce the kind of bready twisty treat you can find in most malls. To add to the effort, she served the sweet pretzels with a homemade gourmet caramel sauce that also went great on Shannon’s funnel cake. We had the salty pretzels with some store bought fancy Dijon mustard. 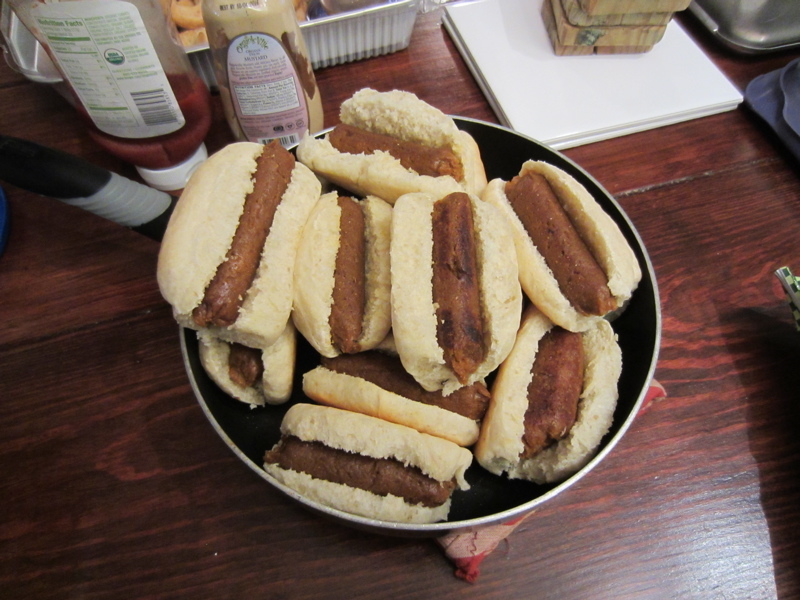 Lauren attempted to make hot dogs from scratch, the frankfurter and the bun. The wieners turned out sausage-like but not with the specific hot dog flavor. The yeast buns, made with a combination of all-purpose and bread flours, a flax “egg,” and almond milk for veganness, turned out better than expected. Since we seemed to all enjoy Attack of the Killer Tomatoes on various levels, perhaps we can have a tomato themed meeting in the future. Then we have an excuse to watch Return of the Killer Tomatoes, Killer Tomatoes Eat France, and Killer Tomatoes Strike Back. 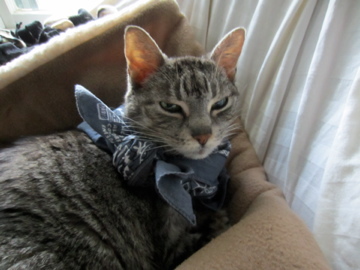 Hemi did not attend the meeting, but she looks nice in a bandana. One Response to "June 18, 2016 – Movie Snacks"